Several ArrowCreek homeowners – including Concerned Neighbors of ArrowCreek (CNA) members (including the authors!) 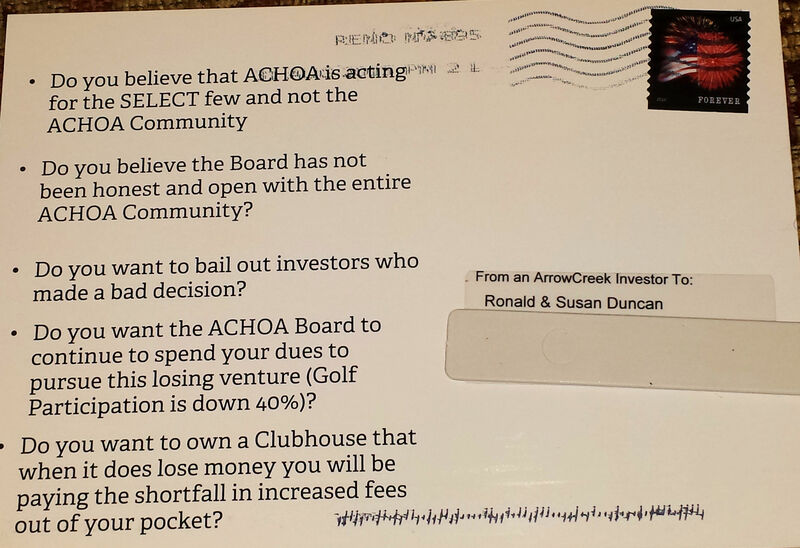 – received postcards in the mail yesterday from “An ArrowCreek Investor” so the ACHOA BOD had better realize that CNA’s posture reaches beyond the boundaries of the development. 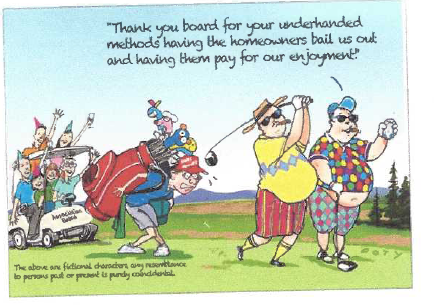 There are more owners than just CNA who are concerned about the ACHOA board’s approach to the golf course. This entry was posted in ACHOA, ACHOA BOD, ArrowCreek, ArrowCreek HOA, ArrowCreek411, CNA and tagged ACCC, ACHOA, ArrowCreek, ArrowCreek 411, ArrowCreek Investor, ArrowCreek411, CNA, Concerned Neighbors of AC, Concerned Neighbors of ArrowCreek, Golf Course, Home Sales, Home Values, Homeowner Association, Homeowners Association, The Club at ArrowCreek. Bookmark the permalink. Though I found the cartoon drawing on the recently mailed postcard a bit ‘over the top’, I believe it perfectly captures what is transpiring here in ArrowCreek. And…I believe this even more so after receiving notice that the ACHOA Board is holding an emergency meeting soon to apparently try and convince the AC homeowners to bail out the company/group that owns the AC golf courses. This flies in the face of the very foundation of America—freedom of choice. I feel like unreasonable pressure is being put on me, as a homeowner, to subsidize a private enterprise. I should be able to decide where to invest my money, not the ACHOA. I am saddened that the Board continues to meddle in issues that are really out of their area of responsibility, by stating the Board wants to protect our property values. Objective data clearly shows that property values would NOT be necessarily affected by golf course presence or lack of presence. The current golf course owners should operate this business SEPARATE from our HOA and the ACHOA and we homeowners should NOT meddle in their business. I am a rejoined member of the club after purchased by the FOA. Many good things happening at the club this year with many new golf and social members joining. I am not an “activist” but this post card is not positive for the ongoing debate. We, the home owners, have not bailed out investors. I am an undecided concerning the HOA owning the golf courses. Ron Duncan should get himself elected to the ACHOA Board if he want’s to make a difference. As he often states only 20% of residents are golfers so should be a landslide. Thanks for joining the conversation and adding your perspective. I’m pleased that you re-joined The Club at ArrowCreek and are enjoying all of the activities they are putting together. We continue to wish the club well. As for my plans about again running for the ACHOA Board, we’ll see. Can I really make a difference on the Board? or can I make more of a difference by not being on ‘the Board?’ Is there enough community support for a Ron Duncan candidacy? Good questions that will need real answers during October. It most definitely will not be a landslide in either direction. The Club at ArrowCreek is a powerful organization and appears capable of turning out its members. So, a prudent person would take that into account before making a decision. I would add that we’ve, CNA, already made a difference in the perception of ArrowCreek. The homeowners WILL bail out the FOA investors if we buy the golf club or subsidize it in any way, and we will carry the financial burden for as long as we live here – that is what the postcard is trying to say. Would the FOA/golfers be interested in selling the golf courses to the homeowners if the plan was to use the property for anything different than golf? I doubt it. Ron Duncan and the CNA ARE making a difference in bringing information to homeowners that otherwise would be suppressed. Tell me why articles like the Kopenhaver article: “Too many Golf courses, Too Few Golfers” are not part of the HOA board meeting discussions or posted on the official HOA (Associa) website to show an effort to be fair and balanced. The last HOA board elections resulted in all FOA supported candidates joining the other pro golf course board members. Wayne Krachun was rejected as a volunteer by the ACCC committee. Any form of open discussion apparently is unwanted by the HOA/FOA or else we would have had town hall meetings and the like from the beginning. The postcard is a direct result of the concerted effort of the HOA/FOA coalition to forge a deal while silencing those that are against it. One of the recurring arguments presented by the HOA board and its speakers, like Rich Kenny, seem to be our home values and that we all need to pay to protect our investment. I for one do not believe that argument, especially here in ArrowCreek. So far, the key evidence presented by the board was the HOA sponsored UNR literature review bout home values. It was mostly based on studies and data collected years ago when the golf industry was still doing well. Newer studies most likely would have different results. In many golf course communities, the course is the only view home owners have. Here in AC, if the two courses would be returned to native desert, we still would have views and open space. We have many articles/studies, old and new, posted on this website saying proximity to a golf course does not matter much. We have the records from the Washoe county assessor showing that proximity to our golf course does not matter much. There are many communities here in Reno and elsewhere in this country where homeowners live around golf courses, but that does not mean that golf course owners/investors (FOA), board members, and golf club members can force others to financially support a golf course, unless the community was originally set up that way. Even if the vast majority of AC homeowners voted to purchase/subsidize the golf club, I believe the majority rules should not be forced on all. Freedom of choice is an absolute basic right that should not be violated. If we could all agree on that one point, this whole controversy could end right now! BUT NO: the board is pushing forward with a special HOA meeting about a golf course proposal on 9/16/15. This impromptu call for a special meeting smells like an ambush and a rush to vote BEFORE the opposition can organize and can be heard, BEFORE long -term financial data about the AC Golf Club state of business can be provided/reviewed, and BEFORE the next board elections. Correct me if I am wrong, but the HOA board did not even abide by our CC&R’s: they did not give us the required 14 day notice for this meeting. Either way, this is an outrageous course of action! In this particular instance, the ACHOA Board is being squeaky clean with respect to our Governing documents. The documents ONLY require a ten (10) day notice of a ‘special’ Board meeting and they complied with that (although in the past they have not been so careful) clause. If the opposition to spending ACHOA resources on preserving this PRIVATE ENTERPRISE, was caught by surprise, shame on them for being lulled to sleep by the ACHOA Boards hidden/secretive activities. I most certainly can guarantee you that there will be organized opposition to a deal that may raise ACHOA dues by 37%. Since the person who sent the postcard didn’t have the courage to sign it, how does anyone know that he/she is an actual investor? The postcard and its ugly caricatures are an insult to those of us who are members of the Club at AC. Welcome to the discussion. Having received the card yesterday, I certainly wasn’t offended by a person poking fun at our situation here in ArrowCreek – we need more levity and certainly appreciate that one persons humor isn’t necessarily another’s. We have approximately 61 investors in ArrowCreek properties. About 32 of them also live in ArrowCreek. That’s about 50%. Many own multiple properties. Some of them may even be club members. Levity? Really, Mr. Duncan? I have yet to hear one bit of levity in the discussion about the purchase of the Club at AC by the HOA. The discussion has been full of enmity and backbiting. There’s so many negative comments about the game of golf and all its trappings. I can’t help but ask myself why those people chose to buy in a community that is surrounded by 36 holes of golf! Because we bought for the views, the peacefulness of the desert and the security of the gates… Could care less about a golf club. I agree with you. Reminds me of the people that buy a house next to an airport and then want to shut the airport down because of the noise. My agreement is with Brooke. I fail to get the rationale behind your analogy. No one wants to “shut the golf course down.” The fact that I don’t live on or near the golf course has nothing to do with this discussion. It certainly does have to do with the quasi governmental organization trying to raid my retirement money. It’s a private enterprise, established as such in our governing documents. Let Private Enterprise be Private Enterprise. There is no logical reason for a quasi governmental body, like the ACHOA, to interfere with a private corporation. Property values are going to follow the market, period. So, there is no need for the HOA to interfere in the free market flow of capital. At least those homeowners by the airport aren’t forced to pay for the privilege of the pilots to land and take off. I haven’t felt the sting of so many personal attacks since I was in High School so many years ago…and Yes, I meant levity. if we can’t laugh at ourselves now and again then we lead a pretty poor existence. I’ll try and address your very hostile comments, which remind me of NK’s letter last February (by-the-way she didn’t sign her name to the letter to 411 either, and yet I responded not with hostility but with truth and facts). Why did I and my family choose to live in ArrowCreek? We chose it because of the fantastic view we are able to have (although it’s changed dramatically over the past 15 years), the gated security (so we can come and go without fear of someone breaking into our home (although we returned from a trip to L.A. and found disarray outside of our home. Thought we had been burglarized but it turned out that a bear had visited)), and perhaps last but not least the special serenity of the high desert. Yes, we were offered a membership in the golf club, $60,000 at that time, but declined as we had everything we needed for our home-at-the-end-of-the-road. Are we surrounded by a golf course, no. We are surrounded by Washoe County open space and the National Forest. Just for the record, this is not a golf community. Yes, many people enjoy the game and the activities of The ‘private’ Club founded as a Non-residential enterprise within the ArrowCreek development. However, many more of us enjoy the swimming pool, hot tub, tennis courts and residents center. We each choose to enjoy ArrowCreek in our own ways and hopefully that ‘life style’ will continue into the future. Just for the ‘record,’ I did not generate nor did I cause the post card to be generated on my or Concerned Neighbors of ArrowCreek’s (CNA’s) behalf. Do I have suspicions as to who might have done it, yes. Especially since there are at least 60 entities who own multiple properties within our development. …or lot owner… property owner is better, I guess…. We have investors of all kinds. Some own homes (more than one), some just vacant lots and still others who own both. In any case, they don’t necessarily live in ArrowCreek but apparently are indeed upset with the course the ACHOA Board has taken.